I’ve been working in the sewer and drain industry since 2002. 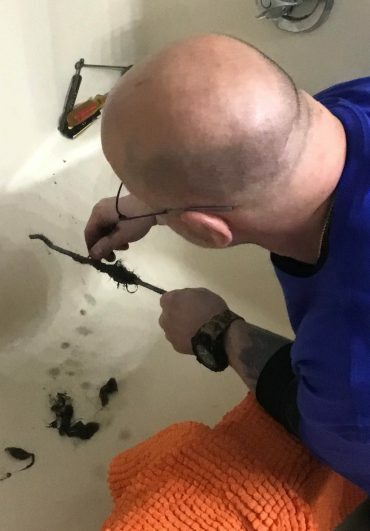 I have serviced hundreds of homes and business across Connecticut clearing all kinds of clogs. There are alot of companies will come and cable your line and leave with little or no explanation of what caused the problem. Not us we take the next step, we inspect the line to find out where the problem originates from. After we clear your sewer main line, septic line or storm drain we will perform a free camera inspection. This procedure allows us to find out exactly happen and if we need to take any further action. For example, 90% of most blockages are caused by roots that are looking for water. Your underground pipes can be a breeding ground for your root problem. Roots start out looking like a thin piece of hair that is actually searching for cracks or openings in your line. The roots then multiply and grow over time causing future blockages. We have solutions for clearing all kinds of clogs. We may need to cable or jet depending on the circumstances of your line. Other possible options are to do a pipe lining or a pipe patch repair. And if none of the above work you may have to excavate as the final solutions to clear up all your issues. No matter what your issue is trust us because WE CLEAR ALL KINDS OF CLOGS! If you are or anyone you know is in the market for purchasing a new house you are required to get your house inspected. Unfortunately, the inspector doesn’t inspect the sewer line. We will give you $50 discount off your camera inspection when you get your line inspected by us. We will evaluation and inspect all the lines in the home so that this can be used as part of your negotiations. These are problems that can be resolved right now by the seller instead by you the buyer.